will have 17 different local artists with wonderful work! 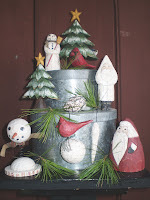 Check out our blog to see many of the artisans and their work - http://www.allthetrimmingsshow.blogspot.com/. Chelsea, to see our fall and Thanksgiving carvings. We've got fall leaves, acorns, turkeys and pheasants. They will be there until...Thanksgiving!